Not buying WhatsApp would have been a disaster for Facebook because a competitor, probably Alphabet, the company formerly known as Google, would have gobbled up the messaging solution, TechCrunch writer Josh Constine noted . Facebook, which is a computer-based solution, needed WhatsApp to enter the brave new world of the mobile Internet. So How Much Is WhatsApp Really Worth? Okay, so how much is WhatsApp really worth? That’s a fair question because just one week before Zuckerberg acquired WhatsApp, the Japanese ecommerce company Rakuten spent $900 million to buy another messaging solution called Viber. It spent less than one 20th of what Facebook spent. Interestingly enough, Viber’s level of growth actually exceeded that of WhatsApp. Viber had around 280 million users at the time of purchase, while WhatsApp had 450 million. Since then, WhatsApp’s user base has nearly doubled, to around 900 million in September 2015, while Viber’s has grown to 664 million , or more than tripled. Despite these numbers, Forbes contributor Eric Jackson believes that WhatsApp could one day be worth $100 billion. The reason Jackson believes that is that Viber is not a messaging app, while WhatsApp is. The key difference is that Viber was designed to make phone calls, while WhatsApp is a messaging or chat solution. WhatsApp is designed to facilitate communication instantly across platforms, while Viber is designed only for calls. Jackson thinks that messaging apps will serve the function in the mobile web that search engines like Google and Yahoo and browsers such as AOL served in the old Internet; that is, to act as a gateway to the Internet, the first place people go to look for information. WhatsApp will become the introduction to the Internet for tens of millions of people in the developing world, particularly Africa, just as AOL or Yahoo introduced many Americans to the Web. 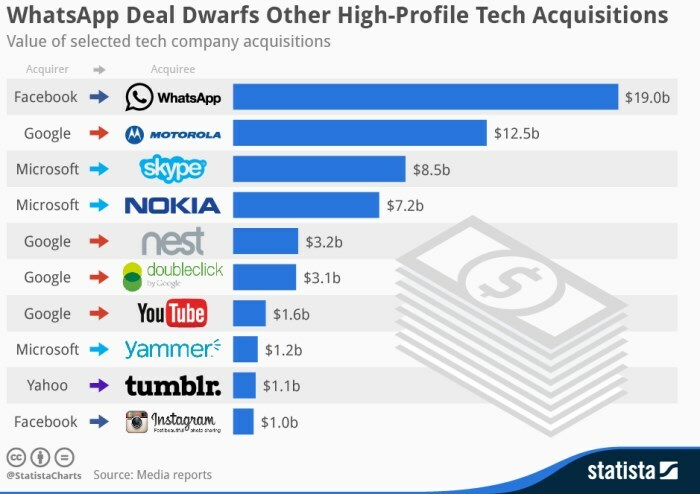 The real opportunity for Facebook to make money comes after people have signed on to WhatsApp. This makes WhatsApp a lot like Facebook. Facebook is basically a browser that is disguised as a social media solution. Zuckerberg’s genius was to lure large numbers of people that were uncomfortable with information solutions like email and Google online. Once he set up his network, Zuckerberg looked for opportunities to monetize it, such as selling advertising. Observers like Jackson believe Zuckerberg will follow the lead of Asian solutions such as WeChat and start monetizing WhatsApp once it hits a certain level of users. There are a number of ways Facebook could monetize WhatsApp that its Asian peers are pioneering. China’s WeChat added an Apple Pay-style solution that lets people transfer money and pay for everything from taxis to snacks from vending machines. An app called Line has been running flash sales in Thailand. These flash sales have attracted 5.5 million customers for such popular brands as Maybelline lipstick and Line’s own branded merchandise, Tech in Asia reported . It also distributed discount coupons for a brick-and-mortar supermarket chain through the same mechanism. Line’s partnership with an ecommerce company called aCommerce could be a model for Facebook and WhatsApp. Its success has been rather astounding; Line has around 22 million users in Thailand, meaning that nearly one fourth of its customers are participating in the flash sales. One strong possibility is that Facebook and WhatsApp could partner with an ecommerce company such as Amazon, eBay, or Alibaba or a major retailer such as Walmart, which is making a huge push into ecommerce, to develop ecommerce. Walmart is spending billions to construct giant ecommerce fulfillment in the United States. It will need some means of attracting customers; WhatsApp could be it. This means WhatsApp’s value could be far higher than we thought, and Mr. Jackson’s $100 billion speculation could be justified. It remains to be seen if such technology could work in the United States, although at least one American retailer, Target, has experimented with such flash sales. Another potential partner is Google, which already operates Google Shopping and is experimenting with its own delivery service. Google and Facebook recently entered into an alliance to share some data about WhatsApp and Android. The ecommerce potential is what could make WhatsApp so valuable. If Facebook could charge a small amount, say 1¢ on each transaction, it could open up a vast stream of revenue. Line could have generated $550,000 in revenue from its flash sales in Thailand alone. Just imagine what Facebook could do if it could set up similar ecommerce arrangements in Argentina, where 78% of Internet users utilize WhatsApp, or Germany, where 56% of those online take advantage of WhatsApp. Obviously, there are serious challenges here; for example, sales taxes and local laws governing ecommerce. Delivery is also a major concern. How do you get the items purchased through the flash sale to the customer? Does the customer pick them up at a brick-and-mortar store, or are they shipped? Either way, there will have to be some sort of logistical infrastructure in place to get the merchandise to the customer. This makes WhatsApp valuable because Facebook could simply open it up for ecommerce. It would take a small cut of the purchase price in exchange for connecting the buyer to the seller, a business model already pioneered by Amazon and eBay. This, of course, brings us to the real value of WhatsApp. How much is each customer worth? That remains to be seen because we are only scratching the surface of mobile ecommerce right now. Therefore it is impossible to tell how much WhatsApp is truly worth because nobody has determined what the limits of mobile ecommerce are, although my guess is that WhatsApp could ultimately be worth a lot more than that $100 million.